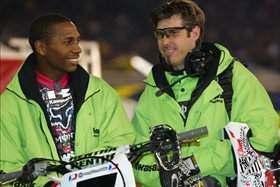 Last May, Ricky Carmichael announced that the Las Vegas supercross finale would mark the end of his full-time career. Since then, the supercross world has been trying to picture what life would be like without RC. Most thoughts turned to James Stewart, who had been billed as the heir-apparent before he had even turned pro. Stewart’s success is based on his speed, even though he had yet to prove he can avoid crashes and mistakes in a full season in the premier class. Supercross officially embarked on its next era when the gate dropped at Anaheim 2, with Carmichael sitting in the CBS TV announcers’ booth instead of on a Makita Suzuki at the starting gate. Not surprisingly, Stewart had the field completely covered on speed, as he dominated the proceedings in practice, his heat race, and the main event. It wasn’t even close, really, and now it seems obvious that, unless Stewart throws it away, the heir-apparent title may eventually just yield to an actual AMA Supercross title. What’s surprising, though, isn’t that Stewart looked calm, mature, and in control with every move he made on Saturday night; the surprising part is that the one card everyone else in the 450 division may have been able to play—consistency—is falling by the wayside. Stewart is one of few 450 riders not battling some sort of injury right now. In the three AMA SX races run this year, he has not only been the fastest but the healthiest, strongest, luckiest, and most consistent. Meanwhile, Chad Reed continues to work on his recovery from injuries suffered around the first of the year. Chad is getting better, but he’s still not able to ride, test, or train during the week. Neither is Ivan Tedesco, who is working to come back from a broken hand suffered in Toronto. Neither is Nick Wey, who pulled a muscle in his arm before Anaheim1 lifting weights (was that this year’s billiards injury?) and has basically only been able to ride a bike during the races. David Vuillemin took a big digger last week in Phoenix, and Travis Preston joined the injured list when he crashed in a tricky rhythm section in practice and landed chest-first on his handlebars. Furthermore, Grant Langston hasn’t finished a race yet after crashing out at Anaheim 1 and then breaking his collarbone a few days later practicing. Team Honda doesn’t have Andrew Short or Davi Millsaps back from injury yet, either. And Kevin Windham is simply missing in action. Stewart taking over this season isn’t a big surprise—he’s riding at an incredible level right now. The fact that so many other riders have had to join Carmichael on the sidelines a bigger surprise.